G.O.D. Int’l recently sent 8 team members to El Salvador. Our goal for this trip was threefold: to continue empowering and educating our staff and student interns on the ground through Bible studies and evaluations of their classes; to host a time of worship, bible study, and prayer for local youth; and to facilitate our Recursos Conference for teachers who work in the Cuscatlán region. I’ve outlined our three objectives in the article that follows. Our student interns are learning the inductive study method, the same method taught at the Institute for G.O.D. to our bible students. Their binders contain handouts and additional resources for them to access as they continue studying the Bible. Working directly with our staff in El Salvador is always a personal highlight for me as the lead manager of our Latin America regional team. They are all working hard to serve God by learning the Bible and practicing those lessons through acts of service amongst one another and for their neighbors. One night as Ben Reese was teaching on the concept of faith from Genesis 15 (a topic requested by our cooperative Antonio Mejía), I observed that everyone was actively engaged in the text, taking notes and writing down questions. Their commitment to learning the Bible is what keeps our work in El Salvador energized and full of life in a country and a community in such need of resurrection. Several youth, for the first time ever, raised their hands in worship and cried out to the Lord. Our biggest Recursos Conference yet! On our final day of the week we hosted our Recursos Teacher Conference in Suchitoto. 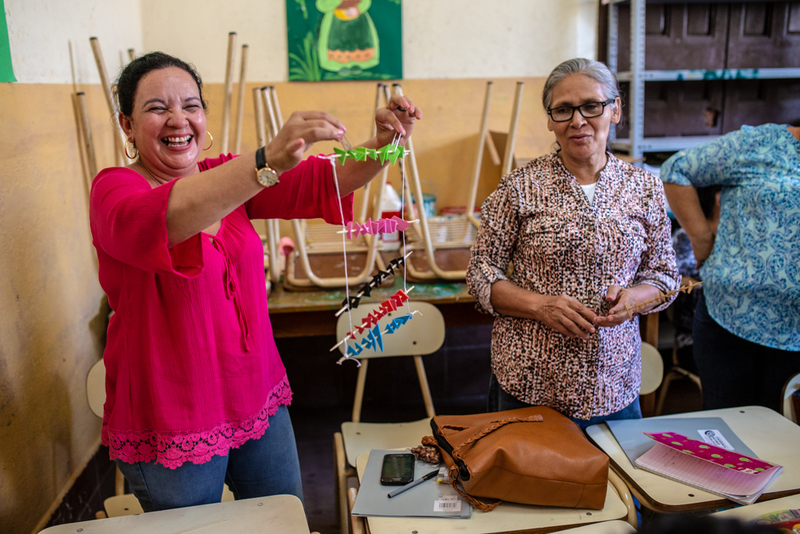 At the request of the Ministry of Education for the Cuscatlán region, this month’s conference was focused on equipping elementary and preschool teachers. Schools were officially closed for the day so that 380 teachers from around the region could participate -- some traveled for over an hour to attend. The conference was organized around the distribution of our latest edition of Recursos magazine. It contained 13 articles on topics ranging from classroom management and the importance of teaching drama to how to cultivate a garden and recognizing the signs of anemia. Now in its third issue, Recursos magazine started at the request of teachers attending our first conferences in El Salvador. The keynote address, delivered by team member Benjamin Reese was entitled “Considering a Child’s Social, Psychological and Cognitive Development in Your Teaching Practice Without Getting Overburdened in the Process.” Attendees also enjoyed workshops where they received continuing education on topics such as classroom management, teaching character values through hands-on projects, incorporating nutrition education into a language arts curriculum, and oral hygiene with methods for teaching. During these workshops, teachers took time to practice what they were learning through interactive dialogue, activities and dramas which they can use with their students in the classroom. We planned for 280 teachers, but were blessed when 380 showed up! This was our biggest conference yet, and we’re already making plans for our next one in October! The work that goes in to these conferences, youth nights, and trips is something our team does because we love God, and God loves the people in El Salvador. There were 380 teachers at the teacher’s conference, but how many more students and families will be blessed by those teachers in return? The young people who attended the youth night are learning what it means to love God and love their neighbor. Thank you for your prayers. God is moving! Simple, hands-on projects can revolutionize an otherwise boring lecture. In this workshop, teachers were given minimal, common materials, and were challenged to turn them into a teaching tool for the classroom! In the workshops teachers worked together to come up with ideas from projects to classroom policies and then presented them to each other. Anna Reyes (L) and student intern, Miguel (R) demonstrate how teachers can use their classrooms as a platform for teaching kids about dental health! Recursos Magazine distributed! Volume 1, Issue 3. Teachers were so excited to read our newest issue of Recursos! The team preparing for the Recursos Conference! Assigning roles and delegating tasks. Student intern, Doris, who wants to be an educator, heads up the hospitality station at the conference.